Gallery of cosmetic make-up of inconsistent emotions. The shown physiognomic symbols in some cases are images of inconsistent emotional expressions in logic combinations of sad and open or joyful and quiet facial features, that supposes correction of emotions by means of cosmetic make-up if face of a woman is comparable with such pictures in gallery. Joyful eyebrows seem outspoken as eyes and mouth express open emotions. The open eyes and mouth seem cheerful as eyebrows express joyful emotions. Eyes and sensations of the person are admired by happy ideas. The person joyfully realizes realization of desires and free expression of feelings. 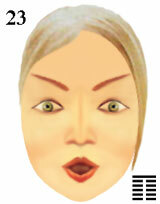 symbol of inconsistent emotions and physiognomic features of a face.